It’s been three years since Amanda and I spent our anniversary up on the Bruce Peninsula. Last year we chose the Niagara region and the year before was Mexico, but we were missing the rugged coast and peaceful trails we found so refreshing in 2012. So, we packed up the car and headed north for some quiet “us” time at the Bruce Anchor Motel in Tobermory. 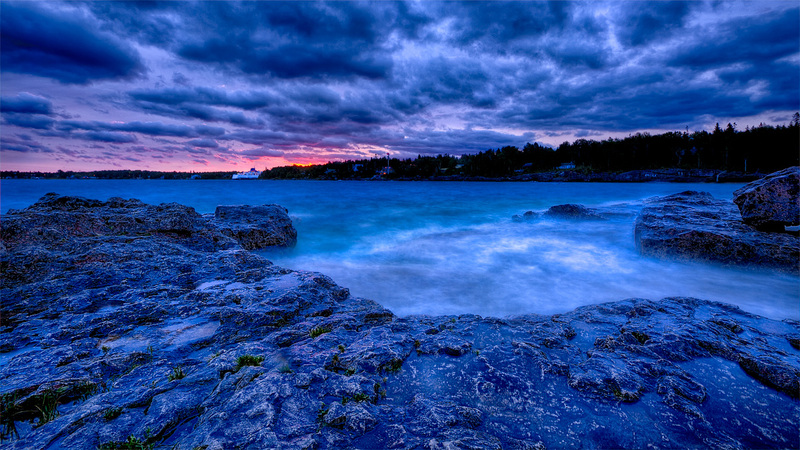 The view from the point at Big Tub Harbour is one of my favourites, especially at dawn. The wind was whipping up the water nicely and the cool air was a perfect pairing to my mug of fresh, hot coffee. Setting up my tripod and camera, I almost missed the shots I came to get watching the sun come up over Tobermory and the Chi-Cheemaun ferry. The philosophy you can experience something or photograph it, not both is one I strongly subscribe to, and I only managed two decent images from Nature’s morning show. Once the sun was finished painting the sky, though, I turned around and was able to patiently take the lighthouse shot I’d missed three years ago. As luck would have it, we ended up bringing some unwanted guests with us on our trip – a pair of wicked sinus colds. It made for an overall lack of energy which really reduced our hiking time but granted us some restful hang-out-in-bed-eating-snacks-watching-movies time. Short treks around town were still possible, sniffling and coughing in unison, so we visited some of the shops with their ‘end of season’ sales and a few of the local eateries. One in particular, Bootlegger’s Cove Pub, really stood out for us – good food, friendly staff and live music. It’s rare for us to dine at the same place twice in a row while travelling, but Bootlegger’s was more than worth it. 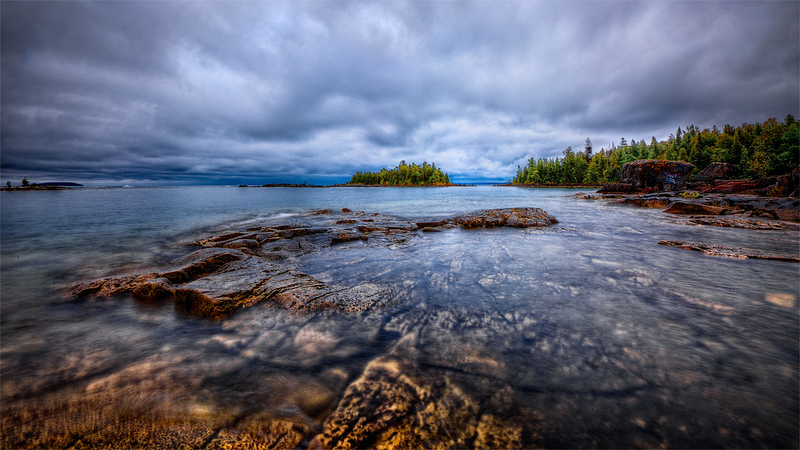 One of the closer hiking locations we got to enjoy was Dunks Point, just a couple of minutes drive east of our motel. We chose to head in from the north side and hike along the water’s edge, which provided us some great views of Georgian Bay, a close up look at the pitted and cracked rocks of the shoreline, and a wide variety of local flora. We spent more time looking at the little details than we did taking pictures, which made for a perfect afternoon together. All-in-all, it was another great road trip to one of Ontario’s more scenic locales. If you haven’t been there, you really should check it out – we can’t recommend it enough. Until next time … cheers! 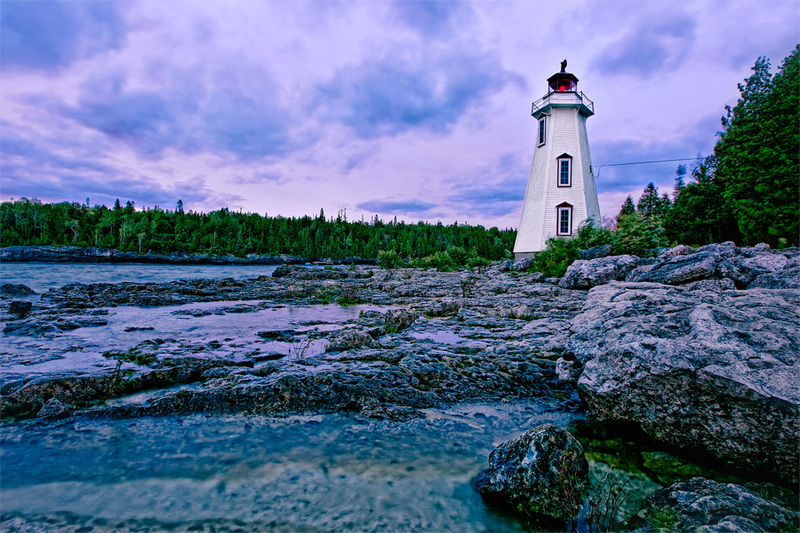 This entry was posted in Travel and tagged Big Tub Lighthouse, Bootlegger's Cove Pub, Coast, Dunks Point, Explore the Bruce, Fall, Georgian Bay, Landscape Photography, Ontario Travel, Scenery, Scenic, The Bruce Peninsula, Tobermory Ontario, Trails, View, Vista, forest, hiking, water.